What people are saying in Cardiff North: It’s about trust and hope. Today people go to the polls for the last time before next year’s General Election. When fixed term parliaments were introduced there was no big splash. Only now are people beginning to realise that 5 years is a very long time. Harold Wilson said ‘a week is a long time in politics’ – and the 50 weeks we have left is a very long time in politics. An election seems long overdue. Cardiff North currently has a Conservative MP. Labour has to win here to get a Labour government. I have been candidate for almost a year and have spoken to 1000s of people on the doorstep. These conversations give me, a strong understanding on the issues that will decide the election in Cardiff North. There are far fewer tribal voters than there were. I spoke to one man recently in his 80s who had always voted Conservative. His wife recently died so he has now decided to vote Labour. ‘I always used to do what my wife told me he said’, so this time I’m voting Labour. Pleased as I am when people decide to vote Labour I couldn’t celebrate in the circumstances. An electorate more willing to switch means the campaign on the ground will count more than it has for a generation. There are three clear challenges for us on the doorstep that sum up these changing political times. This is what I think they are and how we tackle them to win in 2015. ‘You’re all the same’ is something I hear too often. The expenses scandal has stuck. Disgruntled, often older voters tell me they are fed up with politics. Lasting damage has been done to the label ‘politician’. Having grown used to the kudos that comes with being a teacher in an inner-city comprehensive school the new label has taken some getting used to, though being a teacher does help to counter stereotypes. However people still care deeply about their schools, hospitals and local areas. The only way to reverse this perception is by showing through our actions and campaigning that being a Labour candidate is about putting values into action. My campaign with our Assembly Member Julie Morgan to save local bus services generated huge public support. Hard working local Labour councillors are vital people on the ground who show what Labour means. From arranging for roads to be fixed and securing funds to improve shopping areas they show what it means to be Labour and rooted in communities. This is even harder when council budgets are being slashed. Cameron has clearly been hoping that cuts to local government will be blamed on Labour councils or here in Wales on our Welsh Labour government. Other parties, including Conservatves can’t believe their luck in getting away with attacking Labour councils for unpalatable cuts whilst their counterparts in Westminster shuffle through the lobbies voting them in. And neither, I have to say, can I. Persuading younger people to vote is the other disillusionment challenge. So many young voters tell me they ‘don’t really know much about politics’ and say it doesn’t really affect them. The first step is listening to their ambitions and hopes for the future. There is no better way to do this than face to face. The Educational Maintenance Allowance and £3000 grants for tuition fees are two practical ways that our Welsh Labour government shows we believe our future is worth the investment. The people I meet who are most angry are those who have always been in work, who often have two incomes and yet are finding the cost of living is just going up and up. Cardiff North has more public sector workers than elsewhere in the UK most of whom have had no pay rise in the last four years. Families, particularly those with younger children, have felt the squeeze and have also lost out on tax credits and the abolition of universal child benefit. Our policy to freeze energy prices as a temporary measure in order to reform the energy market in the longer term has huge appeal. Privitisation was supposed to be good for the consumer and drive prices down. People want an economy that works for them. Teaching secondary school history for over 12 years I taught the rise to power of the Nazis more than a few times. I changed my approach to teaching it. Rather than being about what these Germans did, it was more about patterns of human behaviour not just in Germany. Throughout history when times are tough easy answers become more appealing. One conversation from last week in Cardiff North which has very low levels of immigration sticks out for me. Donna raised the issue of immigration. She had already voted Labour in the Euro elections but she said her son had voted BNP because we had ‘opened the floodgates’. Her son in his 40s couldn’t find a job and this – she thought – was why. I think this tells us two things. Firstly when people talk about immigration they are saying – things aren’t fair for me. I’m working hard, my family is working hard but it’s not paying off. Farage makes the answer simple. It’s these people – see how they’re different from you. Having a rational debate about immigration controls becomes almost impossible in these circumstances. The answer has to be hope. Saying how we would help young people get good jobs, get the economy moving by helping small business and get money in people’s pockets. For example the Welsh Government’s Jobs Growth Wales has been a hugely successful programme in helping younger people into work. Ed Miliband’s promise to make work pay by giving employers tax cuts for paying the living wage is another example of how we could do this. Donna said she was so fed up that once she had saved up she had decided she would be moving to Spain. People want to be proud of the community and country. We have to offer that hope and a fair deal. It suits the Tories if working people blame other working people. The reality is different The botching of the sell-off Royal Mail is a scandal but money in the pockets of rich speculators does not provoke the same anger as money going to working people who have lost their jobs or have fallen ill. Shares were sold at £3.30 and sold weeks later for over £6 a share. This meant a whopping 750 million pounds (£10 for every person in the country) lost to the tax payer. One of these preferred investors – Fidelity Worldwide has donated nearly £975,000 to the Tories. No wonder they give tax cuts for millionaires. And yet people do not raise this as a big issue on the doorstep even thought they think it a scandal. The story is too far away from most people’s lives. The Labour movement was built one by one. In the work place, in the high streets and in communities. This will always be our strength. Even more so in the age of social media. Meeting and talking with people face to face becomes even more important. Social media is a way of debating, engaging and promoting but meeting someone face to face changes the connection. You can look someone in the eye and more importantly they can look you in the eye. Do I trust her? The Tories will outspend us every time. To convince those sceptical about politics we need our representatives rooted in the communities they wish to serve. Our policies have to mean a life fairer in ways that relate to voters concerns. And we have to convince them that only a government that governs in the interest of the many will deliver a better life for them and their families. We have people to help us talk to people but we need more. We need conversations about hope and about having belief in our fellow human beings. We will only win one conversation at a time. Britain’s first Small Business Saturday was a big success. Chuka Umunna first flagged up Small Business Saturday in Cardiff when he visited a farmer’s market in Llandaff North back in June. Since then, independent traders have worked together to celebrate Small Business Saturday. Over 50 small businesses in Whitchurch took part offering discounts or promotions and the village was awash with blue balloons . The day showed the power of people working together. There was a real buzz around the village and the challenge now is to turn the day into longer term success. Small businesses provide most of the private sector jobs in Wales. Small businesses across the UK provide 60% of private sector jobs and 33% of private sector turnover and 47% of employment. (Federation of Small Business figures) But there is a lot more than the benefits of hard economics and jobs brought by small businesses. Cardiff North doesn’t have just one centre but is a series of suburban villages. From Llandaff North to Old St Mellons, people want to live not just next to shops but be part of communities. It takes courage to go it alone and start a business. I recenlty met Vivian who was made redundant when a prominent Cardiff home furnishings store closed its doors. With her business partner they decided to use their expertise to go it alone. Haus is now a small and thriving business in Rhiwbina. As is Sugar Mouse House, a chocolate shop owner who benefits from a business mentor provided free by Welsh Government. I met an woman last week from Llanishen who is on maternity leave. She has decided to set up a new business. HopnSqueak, making squeaky shoes that mean children get extra fun when learning to walk! It is inspiring to hear the stories that finally made people take the plunge. Small business are part of what make communities . My great aunt ran a newsagent in Cwmafon, in the Afan Valley. In true Welsh tradition she was known as ‘Mag the shop’ and her shop put her at the heart of the community. Newspapers were for the national news, local was by word of mouth. Rhiwbina, the suburban village where I grew up was once like this but there was a time in the 1990s when it looked like it was in decline and only the estate agents would survive. But there has been a shift and businesses are returning to the area. We now have two cafes, some wonderful gift shops, a butcher, a baker, home furnishings and a wine shop as well as estate agents, garage and travel agent – to name but a few. Rhiwbina is thriving. Older people especially benefit from the social connections that come with small business. It’s not all good news however. One local restaurant owner in another part of Cardiff I spoke to this week told me about the cost of his gas bill in his restaurant that was crippling his business. £600 a month and business rates of £3000. 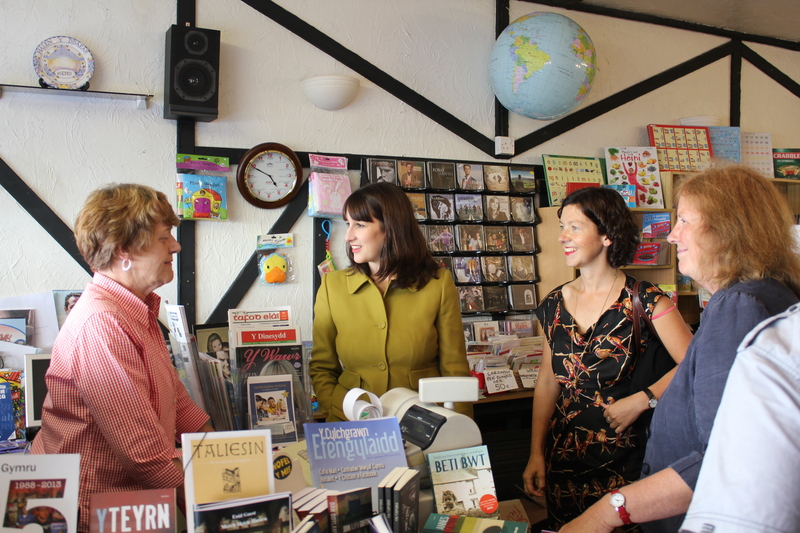 I was delighted when Ed Miliband announced in September that a Labour government would cut then freeze business rates if elected – showing Labour’s understanding of the challenges small business face. In Wales, Business rates will now be devolved and a review by Brian Morgan, Professor of Entrepreneurship at Cardiff Met University will examine the priorities to help business thrive. In October, Edwina Hart, Labour’s Welsh Economy Minister announced two new business rate schemes: Open for Business – giving 50% relief on business rates for the first 12 months on eligible properties. The New Developments Scheme will exempt all new commercial property from business rates for first 18 months. These policies are a start in showing the importance Labour puts on supporting small business. There are plans to build 40,000 more homes in Cardiff which the city needs. However the challenge for planners and for all of us is to ensure that this development is not built around supermarkets and motorways but small shops and walking, cycling and public transport. As America’s legendary Jane Jacobs argued, the safety and life of a city comes from a mix of housing, a variety of businesses and the eyes of the street. In the run up to Christmas many of the small businesses have been working together to attract people to the centres. From Christmas lights and a fair in Llandaff North & Tongwynlais to Santa on his sleigh in Llanishen to Sam Warburton switching on the lights in Rhiwbina. Working together brings huge benefits – and can be counter-intuitive for people used to the cut and thrust of competition. So with Small Business Saturday 2013 behind us, the work now begins to make the choices in our everyday lives that create the communities we want to see. As a party, Labour needs to champion the needs of small business to kick start the economy, provide jobs, strengthen communities and celebrate entrepreneurship. I know the traders will be working together but they’ll need your support. So if you want small businesses to thrive, change your habits. Take a walk, or a cycle and fill your panniers with goods from independent traders. Shop small – not just for Christmas. This post was first published by Labour List here on December 14th 2013. However it is the grave concerns raised by Labour members both in the legal profession and in academia that have drawn my attention to these proposals. Ensuring that everyone has access to legal representation is fundamental to a fair justice system. It is no accident that legal aid was part of the welfare state established by the Attlee government in 1949. Access to justice is fundamental to a fair society. The difference between our legal aid system and the NHS is that we all know that at some point we are likely to need health care. Most people don’t expect to ever need legal aid. There is a need to make savings in the legal aid budget. There is cross party consensus on this. However the most vulnerable in our society should not bear the brunt of the cuts. Women are amongst the groups likely to suffer. Legal aid is now no longer available for most family law and the new qualification for a year’s residency means that vulnerable women migrants will not have access to the law. Women who have been trafficked for sexual and other forms of exploitation and cases to do with forced marriage or child exploitation will no longer qualify without residency. The justice secretary Chris Grayling has proposed a new system where large businesses provide state legal representation. This will not only mean the end for many small high street solicitors but also the beginning of some lucrative contracts for firms without a legal background, such Eddy Stobart. That’s right, expertise in lorry freight is now transferrable to providing people with legal representation. Last week 500 protestors mainly from the legal profession came out to protest. The protestors included Helena Kennedy and Sadiq Khan MP although not former solicitor Jonathan Evans, Cardiff North’s Conservative MP. He is expected to reenter the law profession when he steps down in 2015. He has retained several directorships including of the law firm Eversheds. This should not be just an issue for lawyers. Neither is it an issue for MPs who used to be lawyers. This is an issue about equality. It is our job in the Labour Party to speak out for people who do not have a voice. No matter who you are and how much money you have you deserve a fair trial. Trade unions have had a rough time in the last thirty years. I have grown up amongst a generation reluctant to join trade unions. I know many people who are afraid of being perceived as a troublemaker or being against their employer. 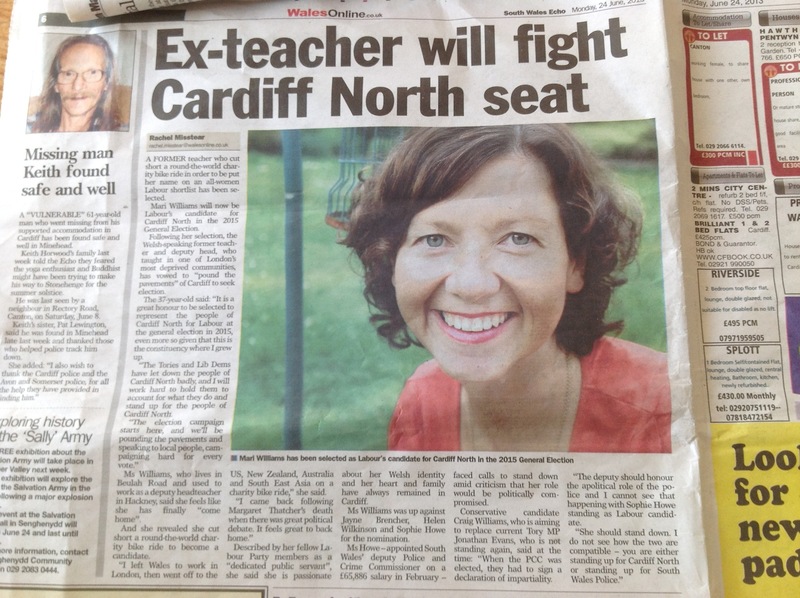 Anita, a friend from my primary school in Rhiwbina, worked for an IT company in Cardiff. After she had a baby she asked her employer if she could work part time. It was only under the last Labour government that workers won the right to ask if they could work part time. The employer said ‘no’ which they are entitled to do. She had no choice but to leave her job. A few weeks later, a colleague of hers, a male colleague, asked to go part time. He was a semi-professional rugby player and wanted to spend more time training. She was not a member of a trade union and chose not to fight the decision. Her story still makes me angry. There are almost 6 million women working part time in Britain compared with 2 million men. Thankfully a European directive means that since the year 2000 companies cannot treat part time workers less favourably than a full time worker; but it is trade unions who make sure this happens. The cynic in me wonders if weakening employment rights is the reason why so many in the Tory party are anti-Europe. There are signs of change with more high profile part time appointments like Belinda Earl hired two days a week by Marks and Spencer to boost sales. However it cannot be just those at the top who change the culture. It has to be right for all workers to have frank and fair dialogue with their employer without fear of reprisal – on an individual and collective basis. I strongly believe in the importance of trade unions and the union link. I have always joined the union most active in my workplace with the most active union rep. In my first school Andy Brown was not only an amazing hard working history teacher but also the NUT rep who spoke up when others were afraid. Union reps are the unsung heroes of the Labour movement. These are the people who put the fair treatment of their colleagues first. 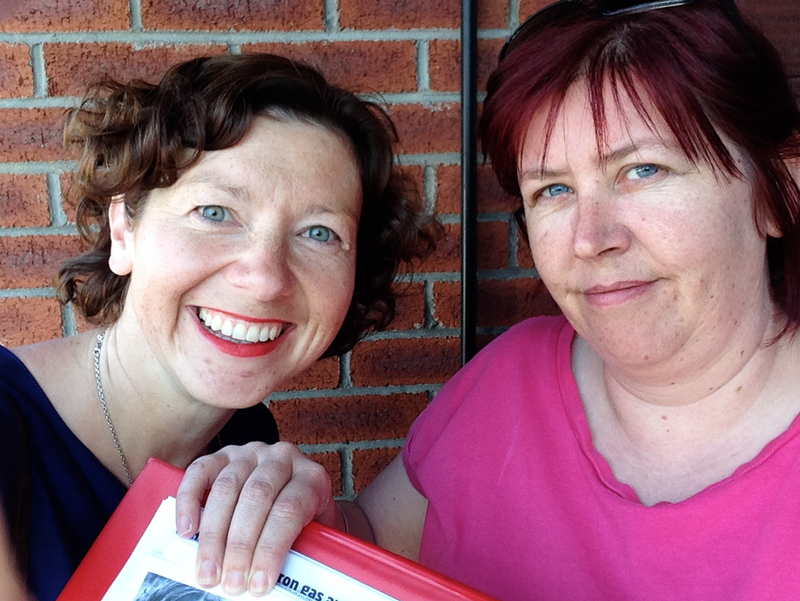 Sally is one such union rep in Llanishen. She negotiated a part time trial for one of her members. Not only was it a huge success but she also recruited someone else to do the job for the other two days – a great example of unions working with business for the benefit of everyone. The Conservatives are already taking away many of the rights established by the last Labour government. For example workers can now only make a case of unfair dismissal if they have been working for a company for 2 years, not one. We do not have to choose between treating people fairly and successful business. You only have to look to Germany, Europe’s most successful economy to know that work place representation can go hand in hand with business success. Labour needs to be proud of our link with the trade unions and make the case that work place representation makes both moral and business sense. Talking with many Labour members, I have learned first hand the impact the Tory government’s lack of compassion is having on the most vulnerable. I met Clive who suffers from bi-polar disorder. He has been stable for four years and because he is over 65 he will escape the reassessment by ATOS but he felt for those who he knew would not escape. I also met Hilary who will not escape reassessment and has been unemployed because of her illness. A recent study for the mental health charity Mind found that three-quarters of people it surveyed said the prospect of a work capability assessment had made their mental health worse and 51% said it had left them with suicidal thoughts. I have also met people who care for partners with dementia. I cannot imagine how hard it must be to watch someone you love deteriorate and detach day by day. There are 800,000 people in the UK with dementia, and this number is expected to grow to over a million by 2021. There are almost an equal number (650,000) of carers. Last week was Dementia Awareness Week and the Alzheimers Society set out to get people talking about dementia. I am a great believer in the power of words to break barriers, challenge ideas and lend support. Words can be powerful if turned into actions. This government is proving itself to be willing to penny pinch from the most vulnerable and those least able to defend themselves. Shameful.